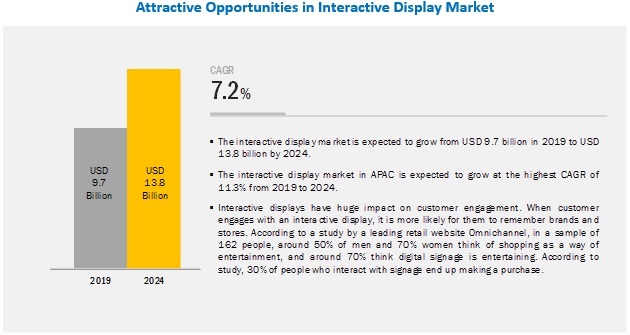 [137 Pages Report] The interactive display market is expected to grow from USD 9.7 billion in 2019 to USD 13.8 billion by 2024, at a CAGR of 7.2% during the forecast period. Growing demand for gamification and digital classrooms, growing adoption of interactive displays in retail sector, declining price of displays, easy availability of interactive products, and increased end-user engagement by using interactive displays for various applications—such as learning, presentations, signage, wayfinding, and ticketing are other major factors fueling the growth of the said market. The interactive display market, by product, has been segmented into interactive kiosks, interactive whiteboard, interactive table, interactive video wall, and interactive monitor. The interactive kiosks segment is expected to dominate and witness significant growth during the forecast period. Software solutions play a major role in the market as kiosk providers have to provide customized solutions to sellers as per the product and location requirement. Interactive kiosks enable retailers to provide a high level of satisfaction to consumers by offering them greater control over their purchase decisions. Through interactive kiosks, customers can choose and buy products on their own, without the assistance of the store staff. Interactive kiosks are user-friendly compared to other informative devices and can accomplish complex tasks in less time on the back of the innovative technology. The market for the transportation vertical is expected to witness significant growth during the forecast period owing to its services such as making reservations, knowing ticket price, getting schedules of arrival and departure, receiving real-time status updates of reservation, and others. They also facilitate wayfinding for travelers and advertise brands, allowing providers to quickly and efficiently communicate to customers the requirements for traveling. APAC is expected to register the highest growth in the interactive display market during the forecast period. China, South Korea, Japan, India, and Rest of APAC are covered under the APAC interactive display market analysis. In APAC, high growth can be attributed to the increased investments by the government in the education sector and the presence of key manufacturers such as Samsung, LG Display, Sharp Corporation, and Panasonic. Key players in the interactive display market include LG Display (South Korea), Sharp (Foxconn) (Japan), Leyard Optoelectronic (Planar) (China), Samsung (South Korea), NEC (Japan), Panasonic (Japan), Elo Touch (US), Crystal Display Systems (UK), Horizon Display (US), and ViewSonic (US). LG Display (South Korea) is a well-known player in the interactive display market. The company has a wide portfolio of displays. The company is expanding its product reach in different regions with product developments and product launches for which it primarily focuses on R&D. In the recent years, the company launched various products related to interactive displays. For instance, in 2018, LG unveiled diverse B2B Portfolio at ISE 2018; in 2017, LG Electronics unveiled a video wall signage in Dubai that has the distinction of being the largest OLED screen and the largest high-definition video wall in the world. The video wall was created using 820 LG Open Frame OLED signage panels. In September 2018, Sharp announced the launch of its flagship 80” 4K BIG PAD interactive display, expanding its 4K BIG PAD line-up to offer a choice of sizes. In September 2018, Samsung and Cisco collaborated to reinvent the professional meeting space. Samsung’s SMART Signage and the Cisco Webex room kits connect to one another to deliver enhanced video conference experience. Cisco Webex room kits can be combined with other Samsung displays to create meetings more interactive and involved in a customized setting. In November 2018, Elo partnered with Armodilo Display Solutions to create a seamless self-serve solution using Elo's touchscreen solutions, which will be fully compatible with Armodilo kiosk stands. Where will all these developments take the industry in mid- to long-term? What are the emerging applications/verticals of interactive displays? How are the advancements in the display industry influencing the interactive display market? Which device type is expected to have a significant penetration in the interactive display market during the forecast period? Which countries are expected to witness significant growth in the interactive display market in the next 5 years? 9.4.2.1 Retail, Healthcare, Hospitality, and Entertainment Industries are Driving the Growth of the Interactive Display Market in Japan. 11.2.2 Interactive Touchscreen Solutions, Inc.
*Details on Business Overview, Products Offerings, Recent Developments, SWOT Analysis & MnM View Might Not Be Captured in Case of Unlisted Companies. The study involved 4 major activities carried out to estimate the current size of the market for interactive displays. Exhaustive secondary research was conducted to collect information on the market, along with its peer and parent markets. The next step was to validate these findings, assumptions, and sizing with industry experts across value chain through primary research. Both top-down and bottom-up approaches were employed to estimate the complete market size. Thereafter, market breakdown and data triangulation procedures were employed to estimate the size of the market based on segments and subsegments. In the secondary research process, various secondary sources have been referred to for identifying and collecting information important for this study. These secondary sources include gas sensor journals and magazines, IEEE journals; annual reports, press releases, and investor presentations of companies; white papers; certified publications and articles from recognized authors; and directories and databases such as Factiva, Hoovers, and OneSource. In the primary research process, various primary sources from both supply and demand sides have been interviewed to obtain qualitative and quantitative information important for this report. Primary sources from the supply side included industry experts such as CEOs, VPs, marketing directors, technology and innovation directors, and related executives from key companies and organizations operating in the interactive display market. After complete market engineering (including calculations regarding market statistics, market breakdown, market size estimations, market forecasting, and data triangulation), extensive primary research was conducted to gather information, as well as verify and validate the critical numbers arrived at. In the complete market engineering process, both top-down and bottom-up approaches have been implemented, along with several data triangulation methods, to estimate and validate the size of the interactive display market and other dependent submarkets listed in this report. Key players in the industry and markets were identified through extensive secondary research. In terms of value, the industry’s supply chain and market size were determined through primary and secondary research processes. After arriving at the overall market size from the estimation process explained above, the overall market was split into several segments and subsegments. To complete the overall market engineering process and arrive at the exact statistics for all segments and subsegments, market breakdown and data triangulation procedures were employed wherever applicable. The data were triangulated by studying various factors and trends identified from both demand and supply sides. This research report categorizes the interactive display market based on product, vertical, panel size, and region.